Legal Nurse Consulting News: When is the Best Time to Begin Your Legal Nurse Training? If you have been considering expanding your career into Legal Nurse Consulting, but can’t seem to find the right time, don’t feel bad. There are many Nurses who feel the same way, and are forced to delay their Legal Nurse Consulting training. Some work full time, some have children to focus on, some have been injured or sick, some don’t have enough money, some have sick family members, some have had a death in the family, and the list goes on. Do any of these reasons apply to you? Have you been thinking about kicking off your Legal Nurse career but the time just doesn’t feel right? While some Nurses are going through some genuinely hard times, most are just finding any reason to avoid beginning. That is when those reasons become excuses. Excuses are good for slowing you down, preventing you from achieving your goals, and making you feel like they are insurmountable. But, it’s important to remember that you decide to use the reason as an excuse. It is usually pretty easy to find an excuse that can be used in any situation. The question is, will you use that excuse as a crutch, or will you make an effort instead. So, when is the best time to begin your Legal Nurse training? The truth is, there is never a perfect time. There will always be a distraction, a responsibility, or an obstacle that can easily divert your attention and prevent you from focusing on your goals. Just know that you can do it if you choose to. You have to decide that you are ready for a change, and use that as your motivation to put forward the effort to make that change happen. Ask yourself: Is your excuse for not getting started a legitimate excuse, or is it one you are using because it is convenient, or you are afraid of something? You may be afraid of change, of putting yourself out there, of what others may say, or of failure. You may simply have a lack of confidence in your abilities. If any of those are your underlying reasons for not starting, you are cheating yourself. You will never know how good you are at something, and how much you will enjoy it until you try it. With LNC STAT on your side, you can easily build your confidence and overcome obstacles as you practice all the skills you need for success. Any fear of failure will vanish when you utilize the most effective Legal Nurse Consulting system available, and get your first case. The Advanced Legal Nurse Consultant (ALNC) certification from LNC STAT is the perfect solution for nurses who must deal with obstacles such as lack of time, a full work schedule, injury, illness, or burnout. Complete your ALNC training at home and at your pace with our interactive home study course. After you become certified, you can earn great long-term income while working independently at home, and setting your own schedule. If time is an issue, schedule out the amount of time you will dedicate each week. If money is an issue, LNC STAT is a solution. The cost of your ALNC certification can be recovered in just 1-2 cases. You just have to find a way to pay for your education until you get started. Don’t make excuses for yourself, and don’t neglect yourself of an exciting and lucrative career opportunity. 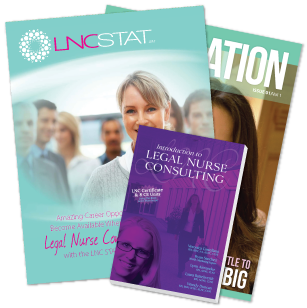 Invest in yourself and your future, and start working towards long term Legal Nurse Success with LNC STAT. Only you can decide your success!